It’s a brand new week, and to celebrate fresh starts, stick it to the man, support self-publishers, and don’t forget to check out this independent comic! As an End of the Universe reader, not only do you get to read about only the coolest and most interesting independent comics accessible via crowdfunding, but the creators have agreed to send any EotU backers a bonus sticker with our site logo– simply identify yourself as having come from this site when you back the book, and receive a FREE End of the Universe sticker! My So Called Secret Identity is created by a team of superhero experts and all-star creators who decided that, rather than simply criticizing the representation of women in comics, they’d show how great the alternative can be. It follows an average girl in her early twenties who loves her incredible city and who is tired of pretending she’s something less than what she is. In order to be her real self, to be as smart, as powerful, as resourceful as she really is, Catherine Abigail Daniels will put on a costume and become a superhero. Gloria City, is filled with vibrant little communities, bright lights, grand architecture and Broadway shows. And most of all, larger-than-life personalities. Gloria has a cast of celebrity superheroes, from corporate boss The Major to the shadowy Misper, from independent operator Sekhmet to the self-appointed armoured vigilante, Urbanite. Gloria is a theater where these big figures fight, posture, pose and self-promote. And if you’re not in a costume and a mask, you’re just little people. All her life, Cat’s been taught to be little, learned to keep herself small, tried to avoid attention. Don’t be too full of yourself. Don’t show off. And most of all, don’t let people know how smart you are, because they don’t like it. And she’s getting tired of pretending, of hiding, of acting dumb to save other people’s feelings. Now that Volume 2 is on its way and being kickstarted, MSCSI fans and newcomers have the opportunity to access a bunch of great new rewards. 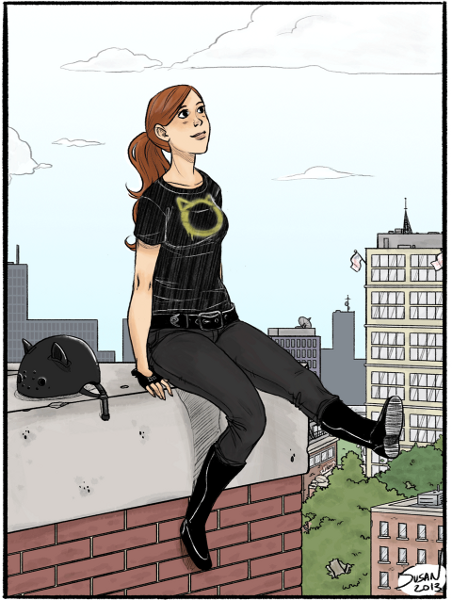 In addition to print and digital copies of the comic, fans can get Cat’s rad logo shirt, a guest art portfolio, and stunning original art prints. Funding for this project ends June 30, 2015. The creators of My So-Called Secret Identity have agreed to ship a special prize for backers identifying themselves as End of the Universe readers. Once you contribute, email info@mysocalledsecretidentity.com, and you will receive a free End of the Universe Sticker with your reward! Keep reading below for a conversation with Dr. Will Booker, internationally-acclaimed Batman scholar, popular culture expert, and co-creator of My So-Called Secret Identity. Why did you choose crowdfunding for this project? MSCSI is now on its second volume and our first Kickstarter, in 2014, was immensely successful, going beyond the target. We now need a larger budget to fund Volume 2 and Kickstarter is the obvious platform for that. MSCSI has been a grassroots, community-based, collective project from the start and we want to finish this story the way we began it, with the support of our fans. Why should End of the Universe readers donate to your book? Your readers should check out www.mysocalledsecretidentity.com, where they can access the first four issues of MSCSI for free, along with heaps of behind-the-scenes art, and rave reviews from comics professionals, bloggers and the mainstream press. It’s a superhero story with women at the forefront — a really diverse range of heroines, including kids, teenagers, single mothers, older professionals, women of color and trans women — and a majority-female creative team. We launched two years ago, and since then, the representation of women in superhero comics has changed significantly: journalists say that’s partly because of our influence and ideas. We want to change things further. What sets your book apart from all the other comics available on and off of Kickstarter? Very few superhero comics have a creative team comprising around 20 female artists. On one level, MSCSI is a powerful story about a young woman whose only superpower is her intelligence. It’s provided a role model and a new kind of heroine for our community of fans, which includes 14 year old young women. On another, it’s actually pushed the industry to adapt and improve. 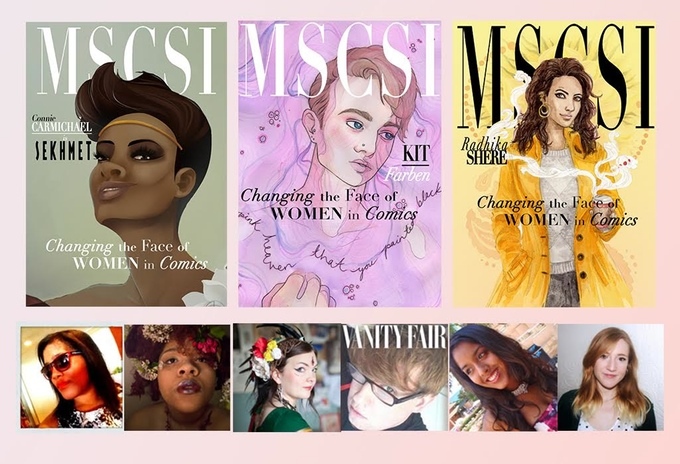 All profit from MSCSI goes to our partners at Geeked Magazine, a feminist collective, and to other organisations we support, such as the Feminist Library. With Volume 2, as well as featuring new artists alongside global superstars of comics, we’re paying brand new writers to tell stories about other characters in Gloria City. This will be their first published work, and they’re all young women writing about a minority experience. If this part of the plan is successful (i.e. your Kickstarter reaches its goals, you produce your content, it’s received with wide acclaim, etc. ), what’s next? How long-term is this? The story of our main character, Cat Daniels, concludes here, but MSCSI is a story-world. We’re already expanding it with new writers and artists, who are focusing on supporting characters and making them the main protagonists, and there’s no limit to the stories we can tell, in the past and future of Cat’s city. Click here to back this project! Posted in Kickstart My HeartTagged costumed heroes, crowdfunding, feminism, independent comics, indie comics, kickstarter, MSCSI, My So Called Secret Identity, self-published comics, small press, Superheroes, women in comicsBookmark the permalink.